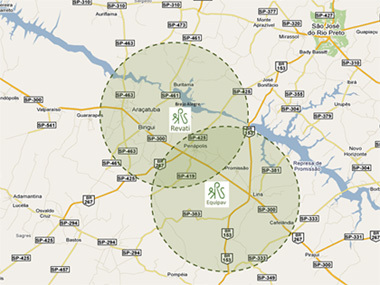 The agricultural companies of Renuka do Brasil have centralized location, forming a cluster around Mills Madhu and Revati. Soil preparation, planting, cultivation, harvest, and transportation are realized on more than 85,000 hectares of leased land in partnership with more than 570 land owners. Also, the agricultural area is responsible for the coordination of sugarcane delivery, and for the harvest and transportation for more than 350 suppliers. In order to guarantee reliability and quality of services, the agricultural area counts on more than 903 owned vehicles, including 62 mechanical harvesters, 50 large tractors and 120 trucks for cane transportation, whose maintenance is almost all done in the company's automotive garages. Besides constantly testing the new varieties of sugarcane, the technical department also keeps close contact with research institutions and supplier of equipment and inputs, aiming for increased earnings from quality and productivity.